I can’t believe we’re almost half way through summer. They’re already talking about going back to school. I’ve been fairly busy. I went to the RWA National conference in Denver. It was fun and always good to see friends you only get to see once a year and to pout faces to names of new people you’ve met online. My first workshop was the one put on by the Kiss of Death writing chapter. It was an all day workshop with eight ATF agents speaking to us. ATF stands for Alcohol, Tobacco, Firearms and explosives. The topics included an overview of the local Denver office, which includes Utah. Did you know that Salt Lake City, Utah has the highest crime rate? We had a certified Fire Investigator, a certified explosive expert, an equipment specialist (gun smith and crime gun intelligence. We learned about drug and explosive sniffing dogs and one of the agents brought in his drug sniffing dog. She was the hit of the day. I also managed a few other workshops on marketing and ads, which I’m hoping to put to use. I got my edits for back from my editor The Fourth Victim, first in The Foundation series, and I’m starting to work on them. I hope to have it finished by the end of the month. I also hope to have a cover for the book by then. That’s always exciting. Along with editing, I’m taking part in a promo at https://www.booksandmore.club/august-book-fair. Drop by, check out, and enter the giveaways. And on August 20th, I’m doing a guest blog on Rochelle Weber’s blog site, https://rochelleweber.blogspot.com. Drop by and say hi. My web person is also getting me listed, working on SEO’s, for my website. That’s exciting. 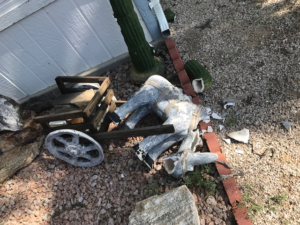 On a personal side, that could interfere with some of my plans, the first of the month we had a windstorm (mini-burst) in Tucson and lost the roof on part of our park model and the deck, as well as losing the carport and my little donkey in the front of the place. 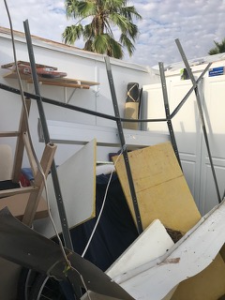 So we’re working with the insurance company on getting things fixed. I may have to fly down this month – not in my plans. We’ll see. And I’m still planning on doing a newsletter. Hopefully you’ll sign up to get it. I’m only looking at doing one about every 3-4 months.